After my crying shame yesterday with the pulpetki, I felt today the urge to rehabilitate with something delicious and also very vegetarian 0_o. Cookies was all for the new experience, though HE SAID that he liked last night’s dinner – actually it was tasty, it just fell apart. But today… damn I’m pleased with myself so much that I feel like patting my own back 0_o. I can’t remember where I found the recipe for this salad, as I stored it in my recipe program and didn’t save the link. As usual the idea is very easy, not too many ingredients, though I believe method this time is very important. 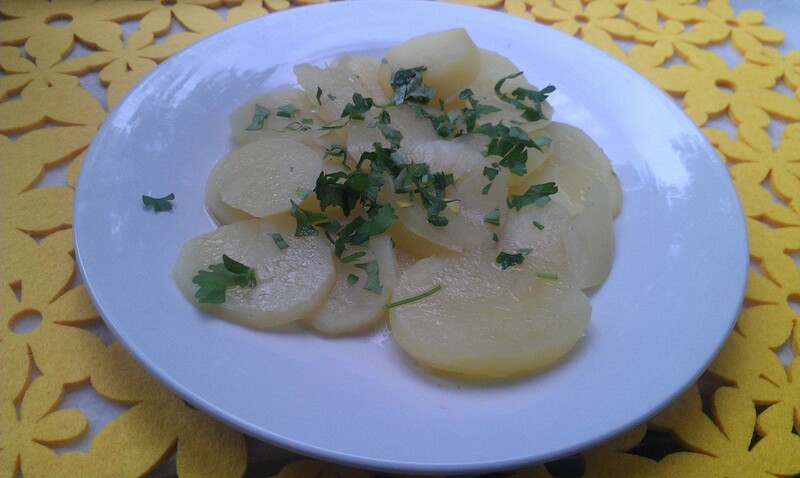 I changed the recipe a tiny bit, as I thought that potatos ask for a little spicy/sour dressing, so I added good amount of black pepper and a drip of white wine vinegar. Peel the potatoes then slice it not too thin (maybe 0,5cm), put into the pot, pour water to cover it and boil until soft (I was standing over it with Granny’s cooking buzzer, 10min max!). Drain and let it cool – try not to break the slices!!! Important for looks. In the meantime prepare the mushrooms, peel if needed, though you don’t have to if skin is not too thick or mushrooms aren’t too old. For sure don’t wash them in water, mushrooms like to soak, then it’s hard to fry them as they stew in water (they do either way, thats why you need to drain them 0_o). Additionally if the shrooms have some soil on them, you can utilize a paper towel to wipe it clean of the soil. As you will make all this decision process (peel or not to peel), cut the mushrooms into slices. 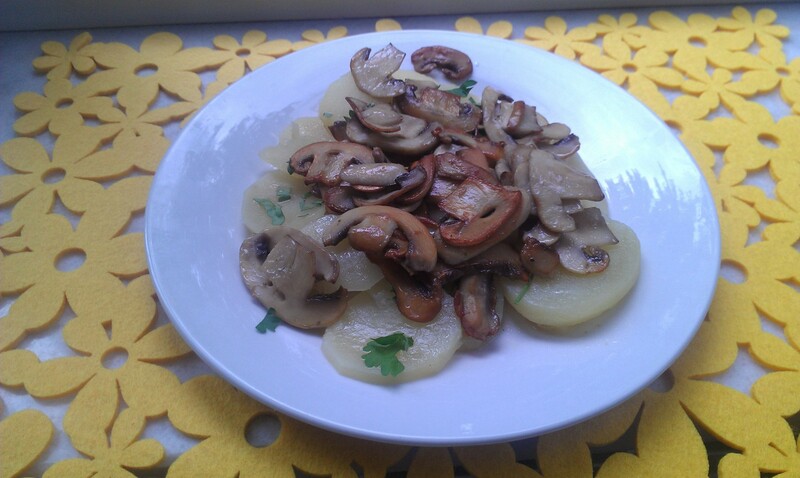 Put butter and oil/olive oil on the pan, heat it up and toss mushrooms in. After some time, drain the water into separate jar/cup and add half cube of mushroom bouillon – stir and put aside. 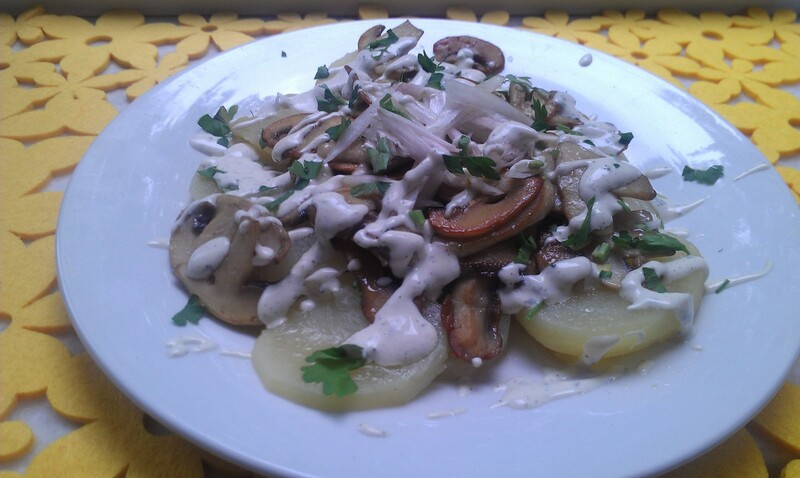 Arrange the potatoes on the plate, then drip a little of mushroom “juice” and toss some parsley on top, add mushrooms as another layer, put on shallots cut into thin strips. Mix the mayo and mustard, pepper and white wine vinegar – stir good. Pour nicely over salad and sprinkle with some parsley.